I am bewildered by the various gender designations currently recognized and described. As a psychiatrist who sees primarily adolescents, I must be able to understand what a person means when they tell me that they are non-binary transgender or two-spirit. Gender and gender roles were so restricted in my adolescence that when I wrote an essay in Grade 8 on why I might like to be male, I was given a very low mark and told to write a make-up essay. I was completely naïve and totally bewildered. I wanted comfortable shoes and comfortable clothes and not to be treated like a freak for getting better marks than everyone else in my classes. Fast forward to the first time a young person told me during a clinical interview that they were pangender and you will realize, as I did, how much the world has changed. At the time, I dutifully wrote down the term and hoped it wasn’t critical to the diagnosis, although I suspected it might affect treatment. That was three years ago. Today, I ask my patients who are still contemplating gender identity better questions and direct them to resources that might help them consider this. It is not only youth who are recognizing gender differently. The Government of Canada now allows citizens to use X on their passports for gender, rather than female or male. As it is now accepted that recognizing these gender differences is the standard of care, let me outline the resources that I have used to be more aware of these changes, which affect clinical care in all disciplines. At the most basic level, all clinicians are expected to provide a gender inclusive environment in their offices. The Gender Spectrum website has some of the best resources to do this and I refer to their material again and again. Remember that, as a person ages, both when they are young or as an adult, their understanding and acceptance of their sexuality and gender can evolve or change. In a world that tries to keep human beings in easily defined categories, it can be difficult to figure out how to characterize your gender. The tools at Gender Spectrum may help both a youth and their family to better understand gender identity. Many struggle to accept this evolution in gender identity, but acceptance is widespread. 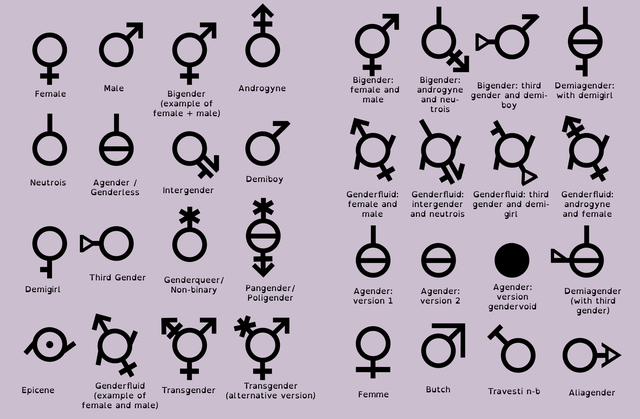 Facebook provides its users 70 possible gender designations. New York City officially recognizes 31 gender identities – my research suggests that this is the most designations of any government worldwide. Many governments, including Canada’s government as I mentioned, have begun to allow citizens to put “X” on their passports when they do not identify as either female or male. Parents of non-binary youth worry about providing the support their child needs. They may have mixed feelings about their child’s sexual identity. Their hopes and dreams for their child may have been based on their gender. Even though many people are more accepting of non-binary identities, many are not. Far from accepting, many are downright hostile. Most non-binary youth that I see have suffered for identity. This is what I remember. It would be much easier for them to identify as male or female. If they can’t, and have suffered because of this, let’s not be the cause of further suffering and exclusion. The compassionate lead of yours and other professionals has brought about acceptance. I admire you Gail. Thank you so much for your reply. Acceptance is so necessary – the world is already difficult enough.